OMBRE BLACKSTAR is only my second product from By Terry. I was intrigued after having seen this in the Space NK catalogue. Its a pen style twist cream eye shadow. It costs £25.45 and I got No.6 Frozen Quartz. The colour is a highly shimmered warm pink with a very slight copper tone, perhaps not the best colour for my cool toned pale complexion but nevertheless a beautiful colour. Pigmentation and staying powder is superb but where I feel this excels over other similar products is how I am able to layer on a powder eyeshadow with ease. Usually I find that I get either the cream base product ball up or the powder not adhere or apply patchy, but with this is applies almost as if over a powder based product. I order a lot of brands online having not seen the colours in person so do rely on reviews and pictures on blogs and sites like MUA, however I don't see that much said about By Terry so its not a brand I have got into, I am impressed enough with these though that I will get another one ( or two) when I next place a SpaceNK order. I was recently sent quite a lot of items from a nice lady from the UK PR for Le Metier de Beaute.I was actually floored by how much was sent and am overwhelmed by the generosity. I also received quite a lot of Le Metier as Christmas presents so I will clearly mark which items were sent to me for free. 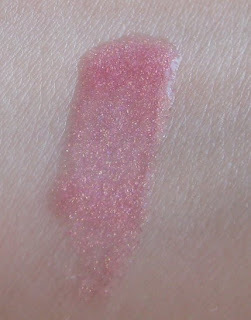 Ibiza Sheer Brilliance Lipgloss (£22) is a warm peachy pink with lots of shimmer. Bali Sheer Brilliance Lipgloss is a warm shimmery red. 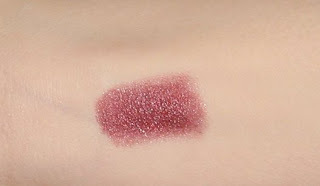 Bondi Beach Sheer Brilliance Lipgloss, is a neutral browned rose. The Sheer Brilliance Lipgloss provide a sheer wash of colour (but enough to show up) and glossy finish. The texture is very lightweight and not sticky or tacky. 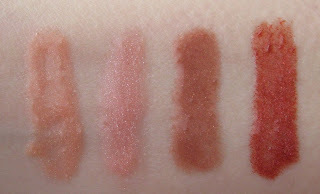 Peche Lip Creme Lipgloss (£25) is a really glossy peach with a slight golden shimmer (far left in the picture above). This shade seems to make my lips look a lot fuller. The lip crème’s seem to be a more pigmented formula of gloss compared to the Sheer Brilliance ones. All the glosses have a doe foot applicator. I am not normally a lip gloss fan but these ones really work for me and hopefully Liberty’s will add some more shades to their online site. I think it you dislike the normal heavy feel and tacky sticky texture of most glosses then you should definitely check these out. Out of all the lipglosses I have tired the only other ones with no sticky/tackiness are Hourglass, although they have a “wetter” feel to them. Disclaimer: Bali and Bondi Beach Sheer Brilliance Lipgloss were sent to me for free. I just want to say thank you to everyone who reads,follows,comments on my blog. I was initially hesitant to start one up but it has been a pleasure reading your comments and finding like minded people ! I thought I'd do a quick list of my beauty brand finds of 2009. 1.Rouge Bunny Rouge: I have immensed a rather large collection of RBR in a very short space of time. My stand outs are the eyeshadows and lipsticks ( I cannot pick out individual shades as I like too many). 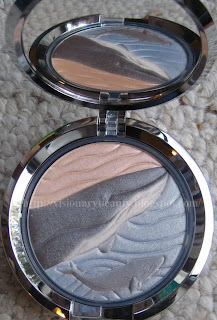 The eyeshadows are amazingly pigmented,creamy in texture and blend beautifully. The lipsticks are really comfortable on and have an amazing array of shades for those who like the more natural lip. 2. Le Metier De Beaute:Its only recently I found out we could get this in the UK ( both in store and online at Liberty.co.uk) . The more I use it the more I know this is going to be one of my major brands. It seems to be a very modern brand and manages to mix natural with the more bold. You can expect to see a lot more posts/reviews from me on this brand soon. 3.Illamasqua:Initially they seemed to have a quiet start and then they just seemed to explode and were the topic of conversation. They have achieved a great relationship with bloggers and youtubers, which created a sense of loyalty to the brand and I still think that this is a brand that people are quite passionate about in their views whether positive or negative.My favourites items have to be the brushes, light liquid foundation and eye shadows in shades, Spectre, Slink, Truth and Fiasco. 4.Hourglass:By comparison Hourglass have a rather small range, but they do have some real gems, my favourites are the eyeshadow duo in Prism and lipstick in Eternal (best deep cherry red I have ever seen). 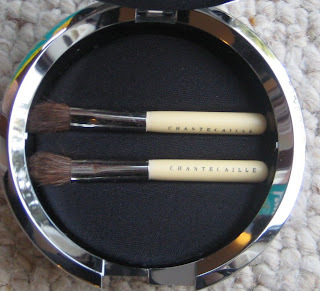 I told myself I would never buy one of the limited edition Chantecaille compacts due to the cost, £85 for what you are getting seems somewhat steep. I know cosmetics brands raise their prices every year usually, but Chantecaille seems to have a more dramatic price rise compared to most (I remember getting the Olivia in Bangkok palette for £48 and the last one I got, the Shadow and the Rose, cost £69). The only reason that I finally made the leap was that Hqhair had a 25% off and I had a bad day at work, so this ended up in my basket. 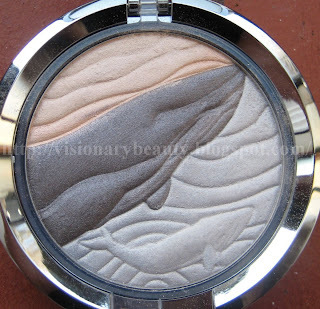 I got La Baleine Bleue, an eye palette containing three shimmery colours (embossed with an image of two whales). The shades are a sheer white gold, a moody grey with blue and purple hues and a sheer icy blue. I’ve posted a pic of what you get and what you are left with when the overlay wears off (notice the missing little whale and white of the larger whale). The compact comes with two little brushes, not sure if its just mine, but the brushes were a bit splayed and not really usable. The lighter blue shade applies more sheer than I was expecting but overall this creates a soft look that I don’t think registers as blue. The problem I have with this is that the two lighter shades are bordering on frosty and the texture. When I go to blend the colours, no matter which brush I use the colour seems to disappear so you have to add on more and they seem to fade during the day. I’ve had a lot of Chantecaille shadows and have only had this happen with this compact and Shadow and the Rose, so it maybe that the newer formulation is not working for me. I also got a cheek shade in wind. I bought this as I wanted a sheer peachy shade, and this fits the bill. This gives a perky flush of colour. 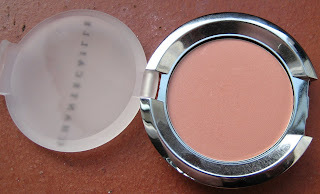 I have had Chantecaille blushers colour change on me in the past but this ones stays true to colour. Just a note that whilst I used to order from Hqhair all the time, after poor service I went elsewhere. Whilst the 25% off enticed me back in, I did have problems with this order. I didn’t receive the mini sized Chantecaille promo, a Christmas present I ordered was not sent and it said on the invoice it would be sent when available, so I am unlikely to get this in time now, (it would be better if they had the same system as sites like Zuneta.com where it clearly states that the item is not available and you can have it on backorder if you like), a shower gel leaking everywhere and a slight chip/smudge on my blusher. After my last post on Le Métier de Beauté, where I expressed concern that Liberty may not be stocking them anymore ( they are currently exclusive to Liberty in the UK) I got an email to confirm that they were staying at Liberty and it was just the case that things were being bought so quickly that they were going out of stock. This is a relief as I really think this is a "me" brand. I should be getting some more glosses,eyeshadow,lipstick and nail varnish for Christmas, so will do a post about that. For now I am just glad I will be able to carry on buying them and am hopeful they will expand what is available on liberty. This time I got Eye Khol in shade Calypso. This is described as a Creamy metallic golden moss and I’d say the description is spot on. 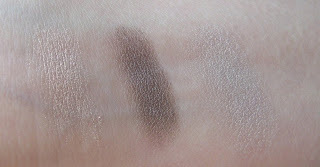 The texture is creamy (no tugging) has great pigmentation and lasts well throughout the day. I don’t have a eyeliner this colour so am really pleased with this and I think the shade works really well with blue eyes. 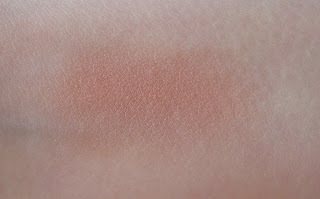 I got another Original Skin Blush; shade Delicata, which is a slightly warm rosed beige. This is such a neutral healthy looking colour it goes effortlessly with any colour combo I choose for lips/eyes. 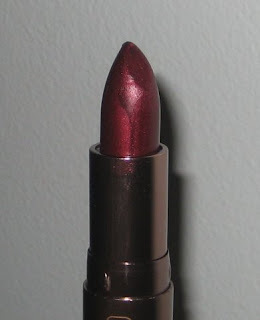 Lastly I got a sheer lipstick in the shade Dark Juices, a cool toned plum with a silver shimmer. The sheer lipstick formula is a joy in these cold months; they feel great over chapped lips. As you may know Zuneta.com has sent out Christmas gifts to some beauty bloggers. I was really surprised and pleased to receive a gift. I got Hourglass eyeshadow in Prism, which is a Smokey slate blue and charcoal black with sparkles. 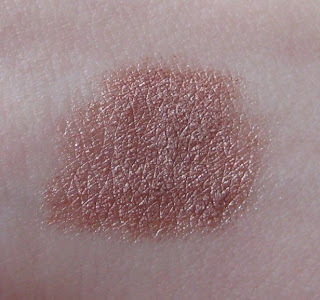 I already have this shade and have done a swatch and review so will give this one to my Mum (http://visionarybeauty.blogspot.com/2009/10/hourglass-eyeshadow-and-lipstick-review.html). 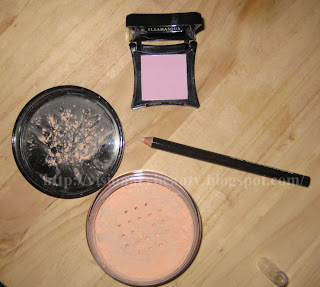 This is definitely the duo to try out first from Hourglass and its colours I reach for a lot. Zuneta are getting a lot of raves for their quick delivery and great customer service, including always responding to email queries quickly and in a friendly manner and for giving out great samples. 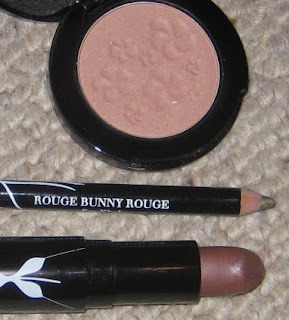 As you know I buy all my Rouge Bunny Rouge from them, but as well as Hourglass they also offer brands like Korres and Paul and Joe. I find them a pleasure to deal with unlike online beauty sites like HQHair. I now own all 11 Illamasqua brushes so you could say I am a bit of a fan! Blending brush 2 is great used for applying the powder to set your undereye concealer and for blending shadow on the lids. The head of this is rather large so bear in mind that if you have a small eye area this may not be the best. Blusher blush 2 is one of those slanted ones that I have never been able to use properly until I realised I had been using them with the tip the wrong way round! This picks up the product extremely well and can get a lot of pigment out of sheer products (such as MAC beauty powders). The foundation brush seems to apply things less streaky that other foundation brushes I have used and it feels very comfortable on the face. 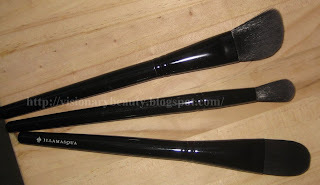 I have also included a picture of the Highlighter brush as I think I forgot to post about this. Its great for powder and cream products. Overall they are the best synthetic brushes I have ever tried and I am looking forward to Illamasqua expanding the range. They are mostly densely packed to allow them to apply things really pigmented but they are also really soft. I have also had no shedding. I know their makeup is not to everyones taste but I do think its worth you having a look at the brushes, having used them a lot more now the only one I am not overly keen on is the shadow one as I think the MAC 239 applies better but my standouts are probably the blusher brush 1 and powder brush. 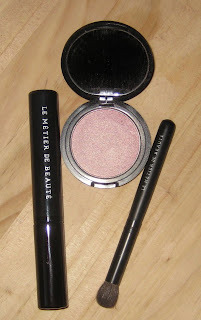 Le Métier de Beauté Rose Champagne shadow, Mascara and a very tiny brush ! If you are in the UK you can only get Le Métier de Beauté from Liberty, unfortunately online nearly all the items are out of stock so I wonder if they are no longer going to stock the brand, which will be a real shame. 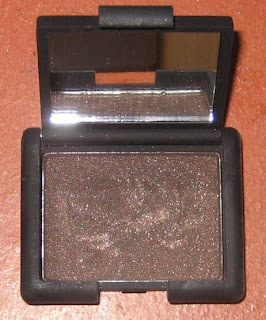 I now have three eye shadows from the brand, they are very smooth,stay true to colour and blend well. This time I got Rose Champagne (£21) which I would describe as a icy sheer pink. This is nice used in the inner lid or just a dab on the centre lid. The Black Anamorphic Lash Mascara (£24), I am quite impressed with. 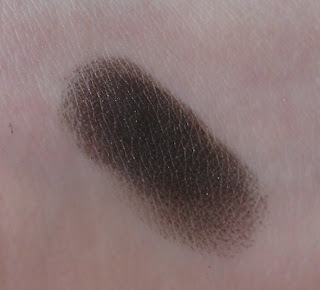 It gives me length,lift and does not smear/smudge, and the colour is quite an inky looking black. My only gripe is that I could do with a bit more volume, I'm undecided if I will buy this again. Sometimes when you order things online you have never seen in person you will get a few surprises. I bought the eye crease brush (£31) and received a rather small brush, a size I would normally associate with travel sized brushes. Performance wise I do really like this, its quite densely packed but isn't scratchy or too firm and it dispenses the product really well, its just a shame it is so small it goes unseen when I put it in my brush pot! I've asked for some more Le Métier de Beauté for Christmas so I am looking forward to that. Even though it seems to be a rather exclusive brand I do think its worth trying out if you can get your hands on it. 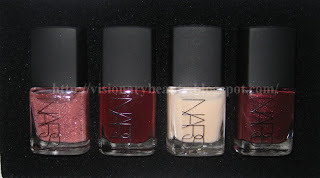 The Drop Dead Gorgeous Mini Nail Kit (£22) contains Arabesque: Pink glitter, as with a lot of glitter shades this feels a bit gritty, Chinatown: deep red, Candy Darling: Sheer palest ivory with a very slight pink tone and Saratoga: Ruby red with gold shimmer. Apart from Candy Darling, which goes on a bit streaky, the others go on well, you need 2 or 3 coats to build to the colour in the bottle and they wear well with minimal chipping. I bought this set for the two darker colours, as I tend to feel a need to wear red round this time of year. I think this would make a really nice gift for Christmas. My favourite is Saratoga! You will no doubt have seen numerous posts about NARS Mekong. I have finally got round to getting this much raved about espresso brown infused with gold micro glitter. In the pan is looks stunning, however once applied in turns into an almost charcoal shade on me. Don’t get me wrong it is a really nice shade but I really want the shade in the pan. 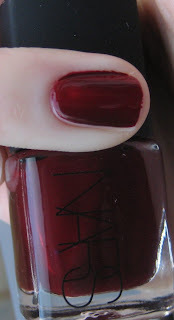 The texture is one of the good NARS one, smooth, blends well, really pigmented and doesn’t fade. Illamasqua Loose Powder, Eyeshadow in Wicked, and Vow Pencil. I haven't bought from Illamasqua for a while after my initial flurry. I did an order for some more of their brushes ( which I'll do a separate post for) and the loose powder,eyeshadow in Wicked and medium eye pencil in Vow. I got the loose powder in shade LP120, to match my foundation shade. I bought this powder primarily to use under the eyes to set my concealer as corn starch is a no no for my acne prone skin. Unfortunately the powder is significantly darker than my skin tone and seems quite warm. 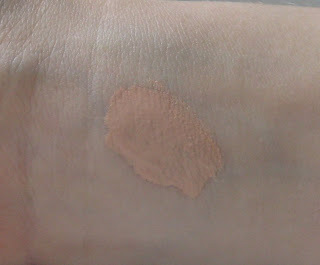 I don't feel like this is a match for the foundation shade so I think you may need to order a shade lighter in this. It did seem finely milled and was not cakey or really powdery on. Its simply too dark for me so I have given it to my Mum who is probably two shades darker than me. I've included a swatch of my foundation on the far right, loose powder is third swatch along (the difference is a lot more noticeable when applied to the face but I thought I'd show you anyhow). The eyeshadow shade Wicked, whilst a pretty cool toned matte slightly lilac pink goes on rather more intense, so I really have to put this on lightly. I had originally bought Hex medium pencil to use as a eye brightener but found it too dark and obvious looking. Vow on the other hand is a neutral cream and makes a great eye brightener (used on the waterline). 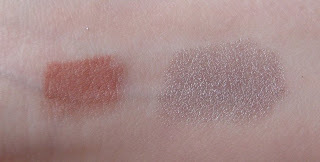 It has a creamy texture, so no fear of tugging and it lasts really well ( swatch is far left). So somewhat disappointing, not sure I fancy ordering the lighter shade in the powder as seems a bit costly to buy two in such quick succession but I may do in the future. 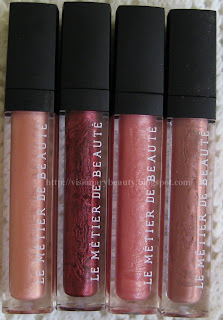 I am very happy with the eyeshadows I have from Le Metier so decided to buy one of the lip glosses. I settle on the shade Dubai, which cost £22 and I bought it from Liberty.co.uk. This is a slightly cool toned pink with multi dimensional glitter with gold being the dominant one coming through. The formula is really comfortable to wear,it does not feel heavy on and is completely non sticky. I have asked for some more of these for Christmas. A great resource for Le Metier products is http://www.thebeautylookbook.com/ .Lina has beautiful photos and swatches which are really true to life, and I always end up wanting more after I have visited her site ! My only gripe with this brand is its exclusivity. In the UK you can only get it from Liberty, at the moment their online selection is limited and a lot of the stuff says its sold out. I rarely do phone orders anymore, as I had a lot of issues with people "losing" my card details, or having to use the phonetic alphabet for every side letter in my name and address, so for me its pretty much buy instore or online. I do wonder if sometimes exclusivity goes to far,when its hard to find out information on a brands products and to buy them I can't but help feel that they are doing themselves out of sales. 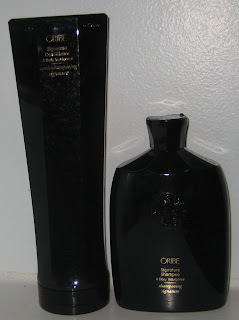 You may have noticed the Oribe hair range getting mentioned on a few blogs and getting rave reviews, what with spaceNK offering 20% off a while back I decided to take it as a sign that I should go ahead and order. I bought the Signature Shampoo (250ML costs £26.43 on Space NK) and the Signature conditioner (200ML costs £31.31). The prices of this range I am sure will put a lot of people off; in fact the products I bought are the cheaper ones out of the other shampoos/conditioners on offer. The shampoo is almost a gel like texture and has a gentle lather. I wouldn’t describe this as a “rich cleanser” as Oribe does and I do think if you have very dry hair this will not be moisturising enough for you. The conditioner is a medium density cream texture. My hair type is dry but prone to greasy roots and damaged (breakages/split ends) due to daily hair straitening and my little boy ripping out my hair (which he thankfully seldom does anymore). Both products caused me no irritation (even thought the Shampoo contains TEA-Lauryl Sulfate, which I would usually avoid but I couldn’t find the ingredients online before ordering so took a chance). My hair is left glossy and detangled and I think the colour is more vibrant. I can however get similar results with cheaper products, the main difference I have found with the Oribe is that my hair stays looking in better conditioner for longer. By lunch time when at work, I always usually need to brush my hair, as it looks a bit lacklustre and dull, when using Oribe my hair looks in better condition so there is no need for the lunch time dash to brush hair. My mother bought the shampoo for beautiful colour (£33.28,250 ML) and she is really happy with it. Her hair is regularly coloured and she uses straighteners/hairdryers a lot but with this shampoo she finds it makes the colour in her hair a lot more vibrant and she also finds it moisturising enough that she does not need to use a conditioner. The suede lip crayon has become available on Zuneta.com . Its priced at £22 and comes in three shades. I bought On Innocence, which is a matte cool toned pinky beige. Texture wise these go on very creamy but do dry down after initial application, the shade lasts very well and feels comfortable on. What I like about this, apart from the shade and the almost opaque coverage is that it is not dry and does not migrate into any little lines in the lip area which I found other chubby pencil lipsticks from other brands do. 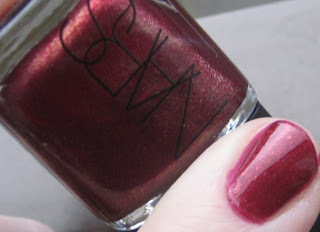 I also got the new shade in the loose glitter pigments (£24), wishing for wings. This is a sheer shimmery silvery mauve. I really like these pigments, they are not messy, last well, non gritty and I don't get any fall out, I've got my eye on the peacock blue ones of these. I think this is a real must have, its not a shade I'd typically wear but this vibrant deep cherry is really pretty and is quite a high impact colour. Hourglass lipsticks are very long lasting and although not particularly creamy they are not dry either. I got this from Zuneta.com and it costs £18, they have recently updated their website and are offering cheaper delivery for those of you outside of the UK. This is my first By Terry product; I don’t tend to hear much about the brand so tend to forget it exists. The Touche Veloutee caught my eye whilst browsing the SpaceNK online store. For my undereye area I use a more hard-core concealer (Illamasqua) on the inner part and then a more lightweight/ highlighting one on the outer area. YSL isn’t enough when I have had a bad night (my 17 month old STILL feeds during the night) my RBR was perfect however just a shade too dark, so the Touche Veloutee looked like it may fit the bill. First up this is quite a sizable tube (pic below comparing it to YSL). This is a click style pen with a brush applicator. I was amazed that with just one click the product came though (you usually have to pump these click style ones for ages). I got the colour Porcelain, once blended it is the perfect colour for me. I am quite pale (probably MAC NW10) so I think this shade maybe too light for the majority. I’d say this was a cool toned shade. They only offer 3 shades so not sure what you are meant to do if you have dark skin? The blurb is “When fatigue strikes, a few strokes of this beautifully textured concealer, infused with nourishing botanicals, plumping microspheres and soft focus pigments, rejuvenates a sleepy appearance” does it deliver? I would say yes, it offers concealment and also highlights and does make the area look smooth, compared to my RBR I will say its not as moisturising and not quite as long lasting. It costs £25.45. Unless RBR comes out with a lighter shade I will re-buy this By Terry one again. lubatti is the brand created by Tracey Malone (Jo Malones's sister). At the moment its a small range offering skincare and some bath and body products. I was on the look out for another cleanser, my PAI one had gone all thick and goopy so I was looking for something that would be suitable for my dry sensitive,acne skin. What drew me to the ALMOND WHITE CLEANSING CREAM was that it looked like a basic cleanser and the ingredients list looked quite simple. You can buy the range from spaceNK or their own site (http://www.lubatti.co.uk) for which they currently have on a 20% discount (code LUB20) so I may try one of their moisturisers as well.